A film like The Dark Tower presents a lot of challenges. It's based on a series of eight novels, a series that has some of Stephen King's most fervent fans. The universe is complex and weird enough that translating it to film is going to be tricky even over a few films. Making a single film digestible for people who haven't read any of the books is nearly impossible. And even worse: neither of the first two books would work as a stand-alone movie, because they're mostly set up and world building (see my bonus reviews of The Gunslinger and The Drawing of the Three below). I liked The Dark Tower. Is it a great movie? Not exactly, but I think it did a good job considering the challenges any Dark Tower movie would face. I definitely don't think it deserves the mostly bad reviews it's been getting (although here's a fairer one from Allie Hanley). I'm neither a die-hard fan (having only read two of the books) nor a complete newcomer. Maybe I'm the type of person who would most enjoy this film. The film begins with Jake (Tom Taylor), a boy in New York City who has visions of an otherworldly gunslinger and a man in black. Starting with Jake's point of view was a wise choice. The first novel is from Roland's point of view, which is a big part of what makes it so weird. Jake is more relatable, almost like the child-heroes of the kinds of 80's movies that inspired Stranger Things (some of which are also based on Stephen King stories, of course). 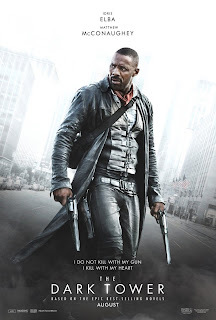 Eventually Jake finds his way to Mid-World and meets Roland (Idris Elba), the gunslinger he's been seeing in his visions. It turns out that Walter, aka, the Man in Black (Matthew McConaughey) is an evil wizard trying to use children's psychic powers to destroy the Dark Tower, which it turns out is the thing that holds the whole universe together and keeps the chaos at bay. The thing I loved most about the movie is the thing I love most about the books (so far): the world building. And I honestly learned more about the world in 90 minutes of the film than I learned in several hours of reading the books, not that the world of the film is exactly the same and not that the experience of the books doesn't make it worth it. I'm not sure why, but this universe is really clicking for me now in a way it didn't 25 years ago when I first tried to delve into it (see more on that in my reviews of the books below). In particular, if the more science fictional elements of the film come from the books, I'm really excited to see what the books have to offer. Philosophically, the film can encourage a lot of interesting questions. Could there really be other worlds parallel to our own, as the Many Worlds Interpretation of quantum physics or the Modal Realism of David Lewis here in our world suggest? Is Roland's life more meaningful because he has a single-minded goal, or is it less meaningful? What would happen if he achieved his goal? Was Jake right to believe that his visions were real before his journey to Mid-World, or should he have passed it off as a hallucination from eating leftovers that went bad? What makes the Man in Black, er, Walter, so bad, anyway? If he thinks he's doing something good, does that mean it's good for him, as relativists would say? Could his actions be both good and bad at the same time? Or is he misunderstood? Why is it so bad to forget the face of your father? What do we owe fathers (or mothers, for that matter: why is this such a male-centered story, anyway)? What can we learn from Roland's reaction to our world? Is our world really an enchanted, magical, mysterious, and humorous place if you learn to look at it right? So to sum up: the movie isn't perfect. All this world building and philosophizing is a bit haphazard and rushed at times. But like the first two books, the movie leaves me excited to learn more about this strange set of worlds and their inhabitants. I don't care what the critics say, I'm hoping for a sequel or three. I first read this back in high school and ... I didn't get it. It's a pretty weird book. But many people whose opinions I respect say they love this series, and with the movie coming up, I figured I'd give it another shot. So did I get it this time? Not entirely. But I feel like I appreciate it more, especially the world building and the crazy (quasi-science fictional?) stuff at the end. I've also been watching the new Twin Peaks, so maybe my tolerance for weird stuff is especially high as of late. And I read the "revised and expanded" edition, which maybe helped. I think when I read this before I didn't like the whole "Old West meets fantasy" vibe. But now I can see that it goes much deeper (and weirder) than that. The whole book has a wispy, frequently unnerving dream-like vibe to it. We get only hazy hints of the world in this book, which I hope will be fleshed out in future books. Now that the series is complete, I might actually read them all if they maintain my interest. As I think King himself admits, this isn't his best written work. You can tell this is a relatively young writer trying (and often failing) to be "experimental." Although the dreamy, disjointed writing style is somewhat appropriate for this world, sometimes all the unresolved WTF? moments and unexplained references bog things down. Sometimes the text and the narrative are meandering and occasionally even boring. Still, I've heard the later books get better, so I will look forward to following Roland a little longer. The Drawing of the Three is a much more typical Stephen King book. You get lots of character development, even of secondary characters, although Roland himself is still a bit mysterious. We pick up on the same beach where we left Roland at the end of the first book. He has to engage in the eponymous Drawing of the Three, which it turns out involves opening doors into our world from his. We first meet Eddie, a heroin addict smuggling drugs on an airplane. Then we meet Odetta/Detta, a schizophrenic woman in the 1960's. And finally there's Jack, who has some surprising connections to Odetta/Detta. One thing I love about the novel is seeing our world through Roland's eyes. If you think about it, our world is pretty strange, wonderful, and terrifying. I take it that's one of King's main themes here. (A theme also taken up more recently in Kij Johnson's The Dream-Quest of Vellitt Boe). We don't see too much more of Roland's world in this one. Mostly we see a beach, but oh my, what a crazy, weird beach it is. Incidentally, I read this book on vacation at a beach in Florida. Florida is definitely a weird place, but not quite as weird as the beach in this book! What we do get, however, is a sense of the wider universe (multiverse?) of how two different worlds are connected, and even some hints about Roland's quest for the Dark Tower. When I read the first two books back in high school, they didn't click with me. Now for whatever reason, I'm really digging the world-building. The universe here is getting really complex and interesting. I've also been reading a fair amount of Stephen King the last few years after not reading him since high school, so maybe I'm appreciating his style, which comes through much more in the second book. I stopped at the second book all those years ago and never picked up the sequels as they were released, but this time I think I will take up the quest to finish the series, not really knowing what I will find at the end but hoping that the journey will be worth it. See my full review on Goodreads.